Needing poolside shelter? 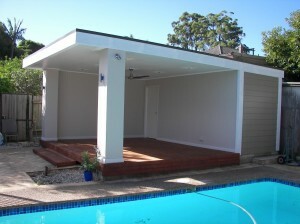 Why not call Outside Concepts Sutherland today and talk about a design for a poolside cabana or gazebo. This neat little cabana provides out of the sun shelter and extra storage all at the same time! 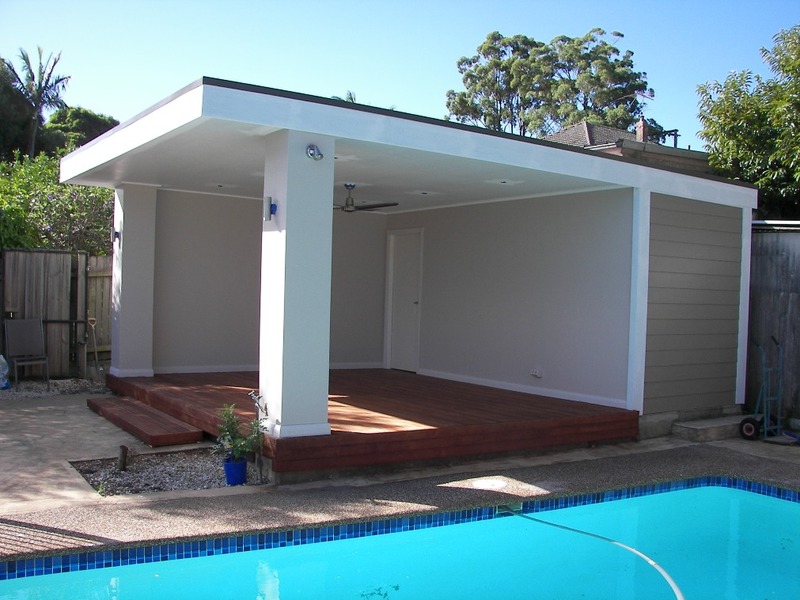 A clever design utilises a flat-styled roof (angled at 3 degrees to ensure good rain clearance) with modern boxed columns. This leaves two sides open to the pool and yard for easy supervision of the children or for informal entertaining. The rear storage space is perfect for all the pool inflatables, chairs and pool equipment – it could even house the pump and filter if extra sound proofing was installed. The ceiling is lined to achieve a streamlined modern look. Wet area lining sheets of villaboard are used on ceiling and walls and ‘blue board’ covers the two columns. Lining and finishing your outdoor living space in this way, saves money while allowing you to have a few extras such as the downlights and fan. These add ‘livability’ to your space – the better equipped your space, the more time you will spend outdoors relaxing! 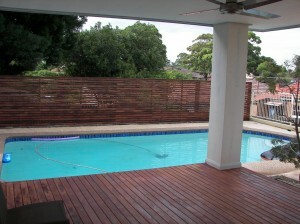 The Merbau deck tops off the design and links it directly to the pool screening beyond. So if you want this level of innovative design and quality construction for your pergola, patio or outdoor entertaining area call Outside Concepts today for an onsite quote and design consultation.